A 35-year-old male presented to the emergency department with gunshot wounds to the head and chest. The patient was intubated to help maintain his airway. Physical exam was remarkable for Glasgow Coma Scale score of 10 and bullet wounds to the right occiput and anterior right chest. Initial labs, including hemoglobin, platelets, and INR, were within normal limits. 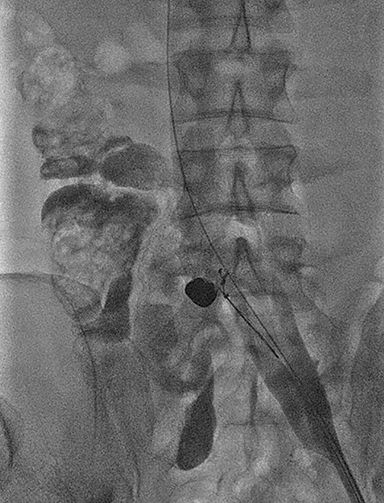 Serial imaging demonstrated a wandering bullet within the inferior vena cava (IVC). An initial trauma chest radiograph revealed a large right hemothorax requiring chest tube placement. 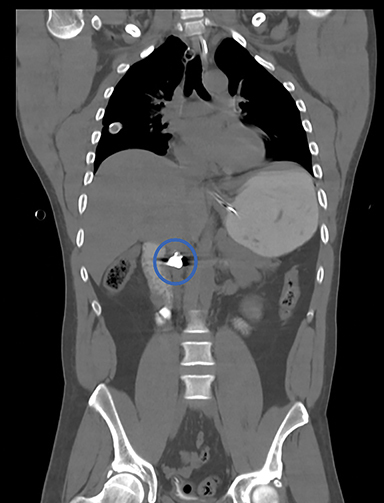 Subsequent CT angiogram of the chest demonstrated that the bullet originated in the right upper chest, traversed inferiorly into the thoracic cavity, and terminated dependently within the right atrium (Figure 1). Associated injuries included a right, second-anterior-rib fracture, right upper-lobe contusion, and large right hemothorax. A chest radiograph obtained 2 hours after presentation to verify central line placement did not show a bullet overlying the right atrium. A consequent abdominal radiograph illustrated a metallic foreign body overlying the right L1 paraspinal area, concerning for bullet migration (Figure 2). A contrast-enhanced CT performed 4 hours later validated the bullet within the IVC at the level of the renal veins, consistent with caudal migration (Figure 3). Given the wandering nature of the bullet, the patient was taken to interventional radiology for retrieval. Angiographic images through a 16 French hemostatic sheath placed via a left common femoral vein approach established a patent left common iliac vein and IVC with cranial migration of the bullet, now residing at inferior cavoatrial junction. Through the hemostatic sheath, a cloverleaf snare device was used to grasp and retract the foreign body into the left common femoral vein (Figure 4). The sheath was subsequently removed and a small skin incision was made alongside the snare device in the left inguinal region. A hemostat was used to dissect the subcutaneous tissues and remove the bullet. The patient tolerated the procedure well without complications. Generally, a bullet that penetrates the body travels in a straight line and exits the skin or traps itself within the soft tissues in the area of injury. Uncommonly, bullet emboli can occur when a small-caliber, low-powered missile has only enough kinetic energy to penetrate a single arterial or venous wall and lodge intraluminally. The intravascular foreign body can then migrate intravascularly, influenced by its weight, gravity, vascular hydrostatic pressure, patient positioning, and vascular anatomy. Bullet embolism is a rare complication of gunshot wounds, occurring in 0.3% of cases.1 To date, fewer than 200 cases of bullet embolism have been reported in the literature.2 Approximately 75% of described cases are arterial, which tend to embolize peripherally resulting in ischemia, and 25% are venous, which commonly embolize centrally to the heart or pulmonary artery.3 Retrograde venous bullet embolism, wherein the bullet migrates peripherally against blood flow due to gravity, is extremely rare, with only 14 reported cases.3 Most venous bullet emboli are asymptomatic. Nonetheless, complications can ensue including, cardiac valvular injury, endocarditis, venous thrombosis, thrombophlebitis, arrhythmia, and pulmonary emboli. 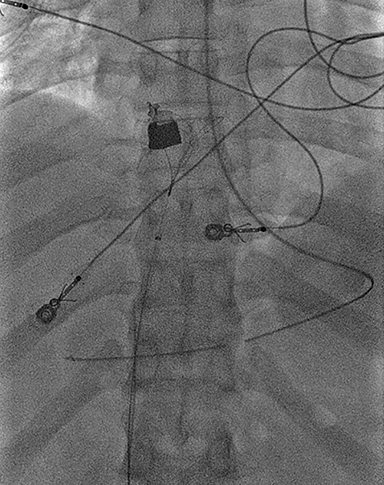 In our case, retrograde migration led the bullet from the right atrium to the IVC; subsequent antegrade migration resulted in the bullet residing at the inferior cavoatrial junction at the time of retrieval. The to-and-fro nature of the migration was due to a combination of blood flow, gravity, patient position, and negative intrathoracic pressure. Intravascular bullets are frequently diagnosed when serial imaging evaluations demonstrate a wandering foreign body, as in our patient. Bullet embolism should further be considered in the absence of an exit wound and when location of the bullet on imaging is discordant with its presumed trajectory. Surgery is generally agreed upon for arterial bullet emboli due to the heightened risk of ischemia. Conversely, the management of venous bullet emboli remains controversial, given that most are asymptomatic. The risks of embolization, vascular injury, ischemia, and infection must be weighed against the risks of extraction. Conservative management has been proposed in asymptomatic patients due to the risks of venous embolectomy. It is important to note, however, that conservative management may lead to complications including cardiac injury, pulmonary emboli, arrhythmias, and central ischemia. Shannon et al specify that the morbidity of a retained projectile is substantial (25%).4 Therefore, the authors advocate extraction in the acute setting (<6 weeks), as removal utilizing modern techniques has a low complication rate (1-2%). Anecdotally, open surgical procedures were undertaken if venous bullet extraction was deemed necessary. However, there has been a paradigm shift. The advent of innovative endovascular techniques for bullet retrieval has mitigated the need for open surgery, allowing for decreased length of stay, enhanced safety, and improved cosmesis. Multiple variations of endovascular retrieval of bullet emboli have been reported in the literature.5-8 In our case, a snare device was successfully utilized to retract the bullet from the IVC into the left common femoral vein. Vascular bullet embolism is a rare complication of gunshot injuries associated with significant morbidity. Arterial involvement is far more common than venous. Bullets may lodge intravascularly and subsequently move freely throughout the vascular system, giving rise to such complications as embolization and ischemia. Treatment of arterial bullet emboli is operative management due to the increased risk of ischemia. However, management of venous bullets remains controversial, as a large portion are asymptomatic. Management should be decided on a case-by-case basis, balancing the risk of embolization against that of extraction. Nagy K, Massad M, Fildes J, Reyes H. Missile embolization revisited: a rationale for selective management. Am Surg. 1994; 60(12):975-979. Duke E, Peterson A, Erly W. Migrating bullet: A case of a bullet embolism to the pulmonary artery with secondary pulmonary infarction after gunshot wound to the left globe. J Emerg Trauma Shock. 2014; 7(1):38-40. Bertoldo U, Enrichens F, Comba A, Ghiselli G, Vaccarisi S, Ferraris M. Retrograde venous bullet embolism: a rare occurrence-case report and literature review. J Trauma. 2004; 57(1):187-192. Shannon F, McCroskey B, Moore E, Moore F. Venous bullet embolism: rationale for mandatory extraction. J Trauma. 27(10):1118-1122. Gaylord G, Johnsrude I. Split 24-F Amplatz dilator for percutaneous extraction of an intravascular bullet: case report and technical note. Radiology. 1989; 170:888-889. Sclafani S, Shatzkes D, Scalea T. The removal of intravascular bullets by interventional radiology: the prevention of central migration by balloon occlusion--case report. J Trauma. 1991; 31(10):423-425. Raghavendran K, Evans J. Bullet migration within the inferior vena cava. South Med J. 2003; 96(1):96-98. Schroeder M, Pryor H, Chun A, Rahbar R, Arora S, Vaziri K. Retrograde migration and endovascular retrieval of a venous bullet embolus. J Vasc Surg. 2011; 53(4):1113-1115. Bansal D, MD; Hussey P, Chiong I. 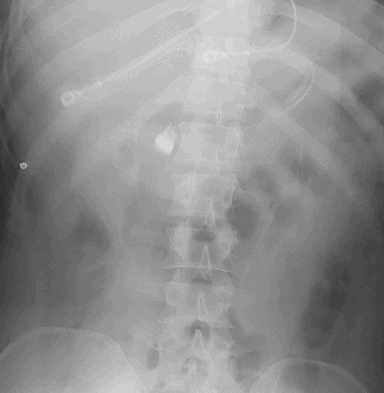 Inferior vena cava bullet retrieval. Appl Radiol. 2019;48(1):48D-48E. Prepared by Dr. Bansal and Dr. Hussey while Radiology Residents, and Dr. Chiong while an Attending Interventional Radiologist, at MetroHealth Medical Center/Case Western Reserve University, Cleveland, OH.